My visit to Magnus Walker's garage. Thursday. A text comes through from my friend Jack. It basically said, "Dude, I'm going to visit Magnus Walker's garage. You coming?" Hell yes I am! Jack is a huge Porsche guy and after meeting Magnus at a meet and exchanging emails, he somehow persuaded his way in, taking me with. After arriving at the garage and meeting Magnus, his wife and their dog, the tour began. We came into a medium sized room with a '67 911S, 911 SC and 924 Turbo. 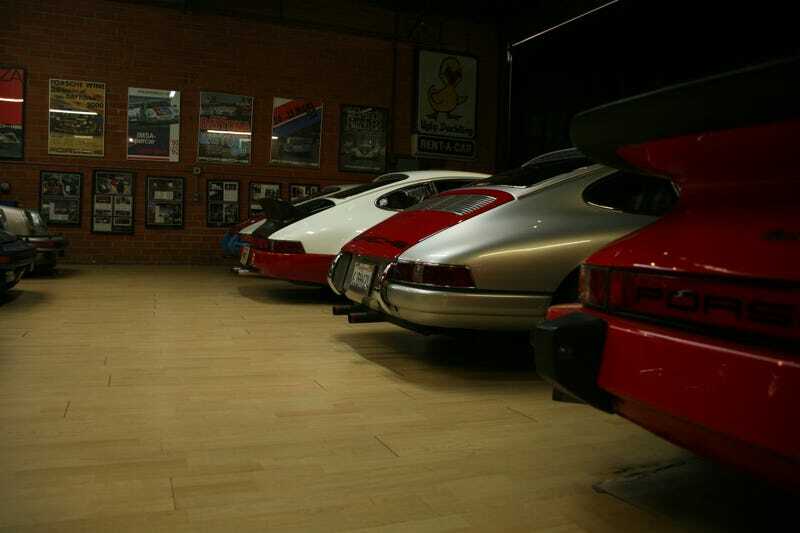 He then took us to the real fun, a larger room filled with about 12 911s of various vintage, including 5 930s. It was breathtaking. I nervously asked if it would be alright to take pictures, and when I got the go ahead, went crazy. I'll try to let the pictures speak for themselves, but I've got to say that Magnus Walker was one of the nicest guys. He was happy to chat cars and show off his incredible collection. I love that he actually drives them and makes a point to take care of them. So if you ever read this, thanks so much. And sorry for the low lighting in the photos, the garage was quite dark. This car is something special. It's 1/15 right hand drive 930s. A beautiful, clean 924 Turbo! There were TONS of spare parts, including engines, gearboxes, and at least 15 sets of Fuchs. Just waiting to be driven.